We are on the first part of The Grindhouse Tour. The tour will stop in Montréal at Les Katakombes on august6 and Québec City at Le Cercle on august 7. 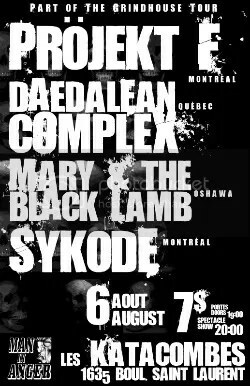 We will shared the stage with 3 amazing bands, Daedalean Complex, Mary and the Black Lamb and Sykode. 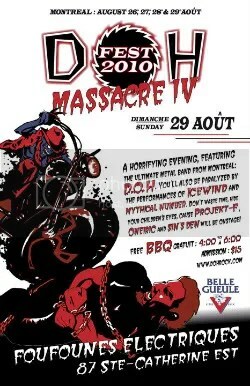 On august 29 we will play the DOH Fest 2010 at Les Foufounes Electriques. This concert will be probably the last one. The time has come to entered the studio for the new album. Previous Article We’re not the Saints!